A major program to build new fields of scientific expertise and expand existing efforts at the University has inspired a $20 million donation to benefit the Physical Sciences Division from Chicago futures trader and alumnus William Eckhardt (S.M., ’70). These plans include construction of the Center for Physical and Computational Sciences, an initiative in applied mathematics and computation, and greatly expanded programs in genomics and personalized medicine, and in the neurosciences. The University also is considering a faculty proposal to establish a new molecular engineering institute. Many of the University’s science initiatives are focused on a paradigm shift that characterizes some of the most exciting areas of science today—a systems approach that allows understanding based upon not only the knowledge of the behavior of individual components, but in addition, how these components interact and fit into a larger structure. The Research Institutes building will become a major venue for the University’s future research in systems-level science. The University will renovate the Research Institutes building and name it the William Eckhardt Research Institutes building in Eckhardt’s honor. The Eckhardt Research Institutes building will be a major component of the new Center for Physical and Computational Sciences, with construction scheduled to begin in fall 2010. 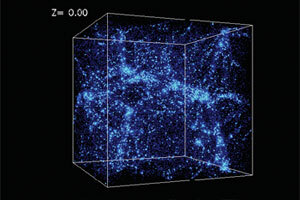 A universe in a box: This simulation, conducted by Andrey Kravtsov, Associate Professor in Astronomy & Astrophysics, is of large-scale structure formation in the universe. The Center will consist of a seamless structure on the west side of Ellis Avenue between 56th and 57th streets. The University has selected HOK as the architect. “The tremendous generosity of Bill Eckhardt will make a major impact on the great science done at the University,” said Robert Fefferman, Dean of the Physical Sciences Division. 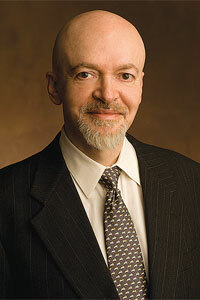 Eckhardt holds two mathematics degrees, a master’s from Chicago (1970), and a bachelor’s from DePaul University (1969). He is chairman and CEO of Eckhardt Trading Company and was among the traders featured in Jack Schwager’s book, The New Market Wizards (1992). “We as individuals and collectively as a society must divide our giving between the support of urgent, current necessities, and incremental, lasting contributions,” Eckhardt said. For nearly three decades, Eckhardt has researched futures price action extensively and has developed many technical trading systems. He drew on his background in the history of scientific methods and mathematical statistics to develop his trading program.